The Top Three Reasons People Don’t Try Acupuncture- and Why They Should! You may know a little bit about acupuncture or you may have never heard of it. Perhaps you know all about it and have decided, “No way, I’m never doing that!”. Take a moment to read my next three posts. Consider if any of these are reasons that are holding you back from giving acupuncture a chance. After reading the following posts you may even want to reevaluate your decision! The first question I hear when discussing my profession as an acupuncturist is, “Does it hurt?, quickly followed by a look of disbelief and doubt when I reply “No.” I completely understand the doubt I see. Who doesn’t vividly remember visiting the doctor’s office as a child and hearing those dreaded words, “You’ll need a shot today.”? And if my memory serves me correctly, those shots definitely hurt. But once I explain how acupuncture needles are vastly different than those feared childhood needles, you’ll understand why acupuncture does not cause pain. The acupuncture needles I use in my practice are thinner than a strand of human hair, which is significantly smaller than a hypodermic needle. In fact, 40 acupuncture needles can easily fit inside the opening at the tip of an 18-gauge hypodermic needle (the type commonly used for blood tests). Acupuncture needles are solid, not hollow, like a hypodermic needle. 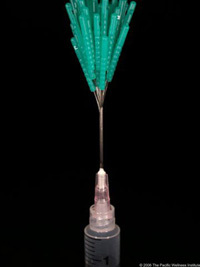 Needles that you encounter at the doctor’s office or when giving blood must have an opening for the medicine to pass though (or in the case of a blood draw, the blood to flow out). “Why does this matter?”, you may be thinking. Well, believe it or not, the tiny hole that is punched in the skin with a hypodermic needle is one of the reasons you experience pain. The solid nature of an acupuncture needle, as well as its miniscule size, allows it to gently glide into the skin.